1913 10d Turquoise-Blue, SG 394. 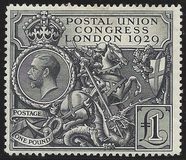 A very fine mounted mint example overprinted 'CANCELLED', Type 24, Spec N31u. Scarce! 1912 ½d Green, Mulitple Cypher, SG 346 IR, WATERMRK INVERTED AND REVERSED. An Unmounted Mint top right-hand corner example. 1913 5d Yellow-Brown, SG 382A. A superb, lightly mounted mint example, WITHOUT WATERMARK, Spec N25A. 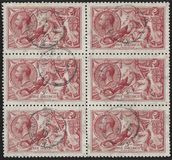 1924 1d Scarlet, SG 419wi. A Superb Unmounted Mint booklet pane of six overprinted 'CANCELLED', Type 28, Spec NB13aau, Watermark Inverted. 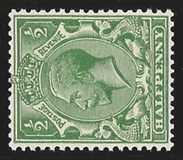 1913 ½d Bright Green, SG 352. A Superb Unmounted Mint right-hand marginal example WITHOUT WATERMARK, Spec N14b. 1912 1½d Chocolate-Brown, SG 363A. A Superb Unmounted Mint right-hand marginal strip of THREE, the RIGHT-HAND STAMP NO WATERMARK; the other pair with Watermark Reversed, SG 362 WJ and SG 363A. 1912 1½d Red-Brown, SG 362A. Stamp Superb Unmounted mint with 'PENCF' ERROR FROM PLATE 12, SPEC N18e. 1911 1d Carmine-Red, SG 327. A lightly mounted mint example with the VARIETY "WHITE FLEUR-DE-LIS", Spec N7h. 1924 ½d Green, SG 418a wi. WATERMARK SIDEWAYS INVERTED. Superb Unmounted Mint. Spec N33c. Cat £600. 1913 1/- Bistre, SG 395wi. WATERMARK INVERTED, Spec N32b. Superb Unmounted Mint. 1911 ½d Green, Die 1B, SG 324. 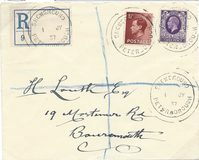 A lower left-hand corner Control A11 block of four with top, right-hand stamp showing variety Blob above 'E' of 'POSTAGE', a white flaw in corner, Spec N2g. Variety Unmounted mint. Cat £275. 1913 9d Deep Agate, SG 392. A very fine lightly mounted mint example WITHOUT WATERMARK, Spec N29A. Very Scarce. RPS Certificate. 1924 1½d Red-Brown, SG 420wi. A corner block of sixteen WATERMARK INVERTED. Stamps Unmounted Mint. 1920 2d Orange, SG 368. 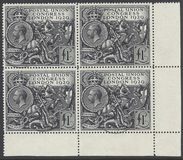 A lightly mounted mint lower left-hand corner control block of nine, the 1st and 3rd stamps in the top row with MISSING CROWN IN WATERMARK, Spec N19za. 1912 1½d Chestnut, SG 364a. 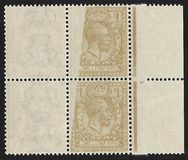 A very fine mint right-hand marginal BLOCK OF SIX showing variety 'PENCF ERROR', Spec N18f, the variety unmounted. 1935 Photogravure 4d BLACKISH GREEN, Spec N58(2). A very fine lower left-hand corner control X/35 block of SIX in this deep shade, Cylinder '9'. 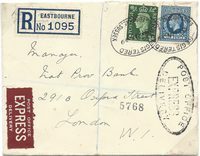 1912 2½d Blue, SG 372. A very fine, lightly mounted mint BLOCK OF FOUR overprinted 'SPECIMEN', Type 23, Spec N21t. 1917 1/- Bistre, SG 395. A superb unmounted mint marginal block of FOUR showing "OFFSET" on the reverse - Rare on this issue.